I can’t believe I forgot it. I had a poster of it on my college dorm room wall. I think everyone in Lathrop did. It’s pretty obvious why this resonated so strongly with the counterculture Boomers, in full-blown generational rebellion against their parents’ post-World War II boosterism and consumerism. …the world is full of trickery. Desiderata is Latin for ‘desired,’ which by implication I take Ehrmann to mean things reached for but not necessarily grasped. So the poem is meant to be a living, continuing, not always successful aspiration, not an end goal of achievement and perfection. I wonder what I did with that poster. Thank you for reminding me. Now I have to wonder where my copy is. I had one too; it is probably in my attic still, along with the ubiquitous “Building a Rainbow” poster. I don’t throw a lot of things away, although I probably should. I seem to recall a narration of it that hit the radio waves as well. I may not surrender all things of my youth but I will surrender the expectation that I can do everything as well as I did then… with the same recovery time! I can push and do (nearly) as much- but takes me 2 days to recover! I really, really like this poem- and strive to live the tenets. Maybe it should be posted in the schools today- and in big business HR offices? Brings back my hippie-chick days when I too had the poster on my wall. We thought deeply in those days (herbally and/or pharmaceutically assisted no doubt), but we sort of skipped over the “surrendering the things of youth” part. I don’t think I want to do that gracefully. More like I am constantly nurturing my inner-child and hope I will have the courage and presence of mind to “rage, rage, against the dying of the light”. 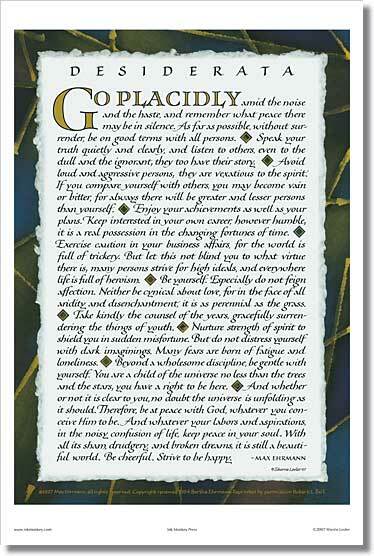 I think “Desiderata” was hanging in every other building in America for two decades. Our family doctor had a huge framed copy of it on his waiting room wall up until ca 1980. Yeah, I still can’t believe I didn’t instantly recognize it. Goodness! I too had forgotten about this poem, also once holding pride of place on my dorm room wall. Thank you for bringing this back to me, and so many others. Off to find a poster! No comment needed from me, Dana has said it all. I am a new fan!!!! Why have you stopped writing “Liam Campbell mystery’s? The original publisher, Dutton, was sold and my editor lost her job, so the Liams lost their home. Since then I’ve brought them back into e-print, which I imagine is where you found them. In the meantime I concentrated on the Kates, a couple of Coastie thrillers and an historical trilogy. I don’t know that I have another Liam story in me at this point, but never say never. FictFact has just announced we are to have a new Aurora Teagarden from Charlaine Harris after a 13-year hiatus. Never say never, for sure! I had the same poster, of course. It hung right next to “If you want to sail big ships, you must go where the water is deep.” The ‘motivational’ posters we have around school these days are much more straightforward and less lyrical, but I still like the “for you are crunchy and good with ketchup” feel of that one.